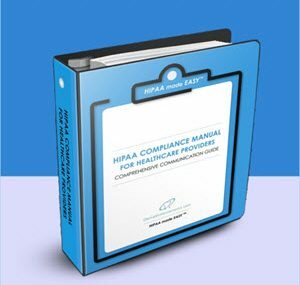 Our HIPAA Omnibus Rule Manual is a comprehensive, easy-to-navigate manual that provides everything you’ll need to be fully HIPAA compliant to federal standard. It’s written in an easy-read style with a “fill-in-the-blanks” format. New PHI Breach Assessment Form and much more…. HIPAA COMPLETE COMPLIANCE SOLUTION. Click to view that item. Call us at 941-587-2864. We’ll be happy to answer any questions you may have about this product to ensure it is the proper fit for your training needs. Dental Enhancements & HIPAA made EASY™ provides legally useful HIPAA compliance information, products and services but does not give specific legal advice. By purchasing and using these products and services, you acknowledge that HIPAA made EASY™ is not an attorney and suggests that for resolution of specific legal problems you would contact an attorney specializing in these areas and licensed to practice law in your particular area. Dental Enhancements & HIPAA made EASY™ to the best of our ability and with the aid of legal support for proper interpretation, does bring you this synopsis of HIPAA Omnibus Rule. This is merely an introduction and overview. You are encouraged to more rigorously study and to apply all specifically related Omnibus Rules into your Practice. For more concise thorough guidance or in the event of a HIPAA inspection or investigation we recommend you to seek counsel from a legal advisor specializing in this area of law. HIPAA made EASY™ is a training platform that will deliver the framework and an overview of HIPAA Omnibus Rule. In purchasing these training materials, you understand this and hold harmless Dental Enhancements & HIPAA made EASY™ and their related companies from charge.